Latest Update made on January 19, 2018. One of the most frequently asked question that our career counselors get from Big Data professionals is – “How to become a Data Scientist?” At DeZyre we have always believed that it is better to learn from Industry Professionals on how to get into the industry. We have organized a DeZyre InSync session to answer this specific question – “How to become a Data Scientist?” The role of a Data Scientist is usually complex and difficult to understand as different industries will have different uses for Data Scientist. But the basic purpose of a Data Scientist is to find meaning from the chaos of Big Data. What data scientist skills does it take for a big data professional to begin a career in data science? What' the best path to becoming a data scientist? CLICK HERE to get the 2017 data scientist salary report delivered to your inbox! We had the pleasure to invite Anirudh Kala, Data Scientist at TopCoder to speak on “How to become a data scientist?” TopCoder is a company that hosts online programming competitions fortnightly to help organizations identify talented and skilled programmers. Anirudh Kala implements Data Science at TopCoder for multiple domains ranging from Epidemiology, Pharmaceutical Marketing and Supply chain, Quantitative Research for Space Exploration Program. You can click on the link below to listen to a recording of the recent webinar on “How can I become a data scientist” presented by Anirudh Kala. The webinar gives a walkthrough on the various steps to be followed to begin the journey in the field of data science. Why should you become a data scientist? A Data Scientist’s job is to convert a huge amount of data into some actionable strategies. According to a recent report from Glassdoor, the median salary for a Data Scientist is $116,000 and there are about 1700 open jobs in the market. The Survey, reports that 45% of the professionals in the US are looking for new high paying jobs in 2016 and the Data Scientist job profile, ranks at the top with a career opportunity rating of 4.1. This is the reason why becoming a Data Scientist is all a rage, among mathematics, statistics and engineering graduates. ​The average salary for a data scientist is $118,709 vs $64,537 for an IT programmer, according to Glassdoor statistics. Data Scientists with expertise in a broad range of data science skills can demand salary package as high as $250,000. “A data scientist is that unique blend of skills that can both unlock the insights of data and tell a fantastic story via the data.”-DJ Patil who devised the term “Data Scientist” in 2008. A person with a die-hard passion to play with large datasets to draw meaningful insights can begin his journey towards becoming a great data scientist. 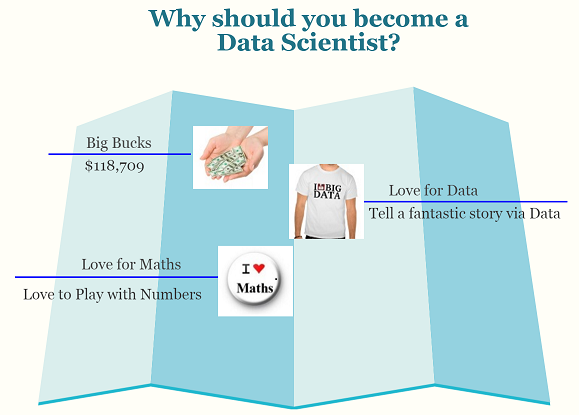 ​Professionals with love for maths and numbers should pursue a career in data science. Most of the undergraduate courses cover linear algebra, probability and calculus but knowing just these will not take a professional far enough in developing big data applications. There is lot more to it diffusion geometry, applied mathematics, matrix diffusion and more. What you need to know to become a data scientist? The data scientist skill set is in a constant state of fluctuation. Many people confuse themselves with the thought that if they gain expertise in 2 or 3 software technologies –they are all set to do data science and some think that if they learn machine learning they can become a data scientist. It is an undeniable fact that all these things put together can make you a great data scientist but just having these skills will not make you a data scientist. A great data scientist is a big data wrangler with the ability to apply math, quantitative analysis, statistics, programming and business acumen skills to help an organization grow. “Technical skills clearly are among the traits she looks for in job candidates. But another that's high on her hiring-priority list "is being grounded and having this very realistic, get-things-done attitude.”-said Monica Rogati, data scientist lead at Jawbone. Solving a data analysis problem or building a machine learning algorithm does not make you a great enterprise data scientist. A person who is an expert at programming and machine learning but cannot glean valuable insights to nurture the growth of an organization cannot be called as a real Data Scientist. Data scientists work closely with various business stakeholders to understand where and what kind of data can add value to real world business applications. A data scientist should be able to discern the impact of solving a data analysis problem on the business- what is the criticality of the problem being solved ,identify logical flaws if any, in the analysis results and should always question themselves on - does the result of the analysis make sense to business. “A strong business sense is a vital trait of effective data scientists -- an idea of "what's doable, what's feasible and what's important.”- said Yael Garden, director of Data Science at LinkedIn. A data scientist should be able to steer through multifaceted data issues and sophisticated statistical models whilst maintaining the business perspective. Translating business requirements into datasets and machine learning algorithms to elicit value from the data, is one of the core responsibilities of a data scientist’s job. Communication plays a vital role in data science because through the entire data science process, a data scientist has to closely communicate with various business partners and stakeholders, nothing can happen in isolation from them. Data scientists work in collaboration with various top level executives within the organization like marketing managers, product managers to figure out how they can help each of the departments in the organization grow with their data driven analysis. ​To enter the field of data science, a solid foundation in statistics is a must.Professionals must be well-versed with what the various statistical techniques are and when they are or aren’t a valid approach to a data driven decision making problem. “Understanding correlation, multivariate regression and all aspects of massaging data together to look at it from different angles for use in predictive and prescriptive modelling is the backbone knowledge that’s really step one of revealing intelligence. Nothing more to say. If you don't have this, all the data collection and presentation polishing in the world is meaningless.”- Mitchell A Sanders, data science expert. ​People often ask themselves “Do I need to be a BIG time coder or an expert programmer to pursue a lucrative career in data science?” The answer to this is probably no. Expertise programming skills can always come as an added advantage in the career of a data scientist but they are not mandatory. Programming skills are not required for developing a big data applications but they are rather needed to solve a data equation that is otherwise time consuming to be solved manually. If a data scientist can figure out what to do with the dataset, it is enough. 1)What graph is getting more information? 2)What graph is turning more complex? 3)What graph is actually making more sense? Professionals with expertise in various data visualization tools only can answer these questions. A data scientist has to be well-versed with a project end-to-end and have in-depth knowledge of what’s happening in a project. This helps a data scientist understand and comprehend what he has to do from a data standpoint. A data scientist job role requires doing loads of exploratory data analysis on a daily basis using various tools like Python, SQL, R, and Matlab. Every day in the life of a data scientist involves getting neck-deep into the large datasets, understanding them, processing them, learning new things and making novel discoveries from a business perspective. A data scientist’s job role is a blend of art and science that involves fair amount of prototyping, programming and mocking up data to decipher novel outcomes. Once they find any desired outcomes they move forward with them for production deployment where their customers can actually experience them. Every day in the life of a data scientist requires coming up with new ideas, iterating them on already built products to develop something better. 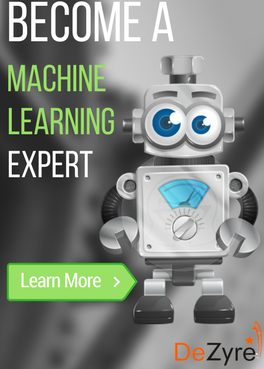 Begin with a basic Machine Learning course that takes you through the basics of Mathematics, helps you understand what it takes to solve an equation to what it takes to solve a problem through algorithm, what happens behind a machine learning algorithm. The first essential grind of skills that you need to learn are basic statistical programming tools like Python and R. When dealing only with numerical datasets, you need to have expertise in R whereas a good grasp of Python is necessary to deal with textual datasets. 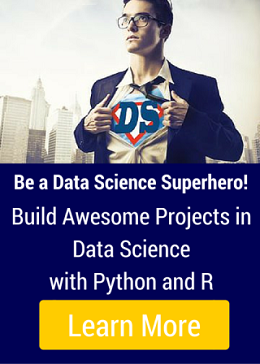 Thus, Python and R language both co-exist in the data science ecosystem. Pursue a fundamental course in statistics that covers basics of stats, different branches of statistics like the design of experiments and linear optimization. 1) Choose a dataset that you are curious or passionate about. 2) Work with it and explore the dataset completely to unveil interesting insights. 3)Communicate the findings in simple langauge with easy to understand visualizations. Apache Hadoop is important as it allows programmers to read data from HDFS that splits data, puts into files and then can be read from different machines. The major computing platform of Hadoop i.e. the MapReduce at times produces leniency lag which requires using newer frameworks like Apache Spark. Apache Spark focuses on in-memory data analytics, something similar to what R language does but with Spark it can be distributed. Spark uses RAM of each machine to make it appear like an abstract bigger RAM of all those machines, this is the reason why Spark is gaining traction among data scientists. Spark H20 – A new platform for scalable machine learning.Scalable machine learning is the practice or process of taking large datasets to train the algorithms to as huge as terabytes of data to increase the accuracy of the algorithms. Apache Mahout- Mahout offers machine learning with Hadoop without the programmers having to code any MapReduce as everything is pre-configured in Mahout. It is something similar to R but on a parallel processing environment. SciPy or SciKits –SciKits machine learning package in Python is something that every data scientist must use for scalable machine learning. Hands on with SQL is a must It is a big challenge to understand the dicing and slicing of data without expertise knowledge of various SQL concepts. Develop expertise in statistical learning and implement them in R orPython based on the kind of dataset. Understand and Implement Big Data, more the data better is the accuracy of a machine learning algorithm. Data visualization –the key to mastering data science as it gives the summary or final shape of the solution. Click Here to View the Complete Presentation on "How to become a Data Scientist"
Having gained good grasp of all the above mentioned data science skills, tools and technologies, are you all set to apply for the job role of a data scientist? Becoming data scientist requires a great measure of curiosity even if you do not have a Master’s degree or a PhD. If you can gain expertise about various big data technologies, the analytics space and machine learning world by signing up to one of online courses provided by DeZyre, Coursera or Udacity- it will be an amazing start to begin your career as a Data Scientist. These open online courses help a candidate become comfortable with programming which is a core skill required for data science. Having taken the courses, you should always practice on various hands-on projects to develop solutions to some sort of a real world problem. This shows your curiosity and enthusiasm to get into the data science space. You can learn data science by actually doing it and that’s the only way one can become a good data scientist. Data science needs lot of experiments and practice on real world data driven decision making problems faced by various organizations.So, to ensure that professionals do not face rejection, it is suggested that one should apply for a data scientist job after mastering data scientist skills with some real time data driven decision making problems. A great way to begin with solving real world data driven decision making problems is to take part in various data science competitions hosted by TopCoder and Kaggle.UCI Machine Learning repository can be used as a base to experiment with various datasets. Do you want to stay updated in your Data Science Career? 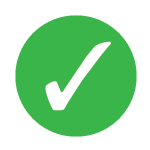 Check out Hackerday - every month you will work on live online expert-led hackathons. 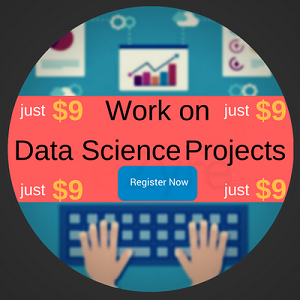 In these 5-7 hour hackathons you will work on a project in groups to learn the latest in Data Science. The journey towards pursuing career as a data scientist is definitely not a cakewalk as professionals need to learn several new disciplines, various statistical tools, programming and the most obvious expose themselves to real-time data driven decision making problems. Thus, to become a great data scientist it needs hard work, time and personal investment but the end of the journey is definitely fruitful and rewarding.